Zach Anner is an award-winning comedian, show host, TV writer, viral sensation, disability advocate, and public speaker. In 2011, he won his own travel show on the Oprah Winfrey Network, Rollin’ With Zach. He worked with Rainn Wilson’s media company SoulPancake, hosting the shows Have A Little Faith, (which explored world religions), Earth Your While (which started a conversation on climate change), and Top of the Monday (which introduced good news stories). He tried his hand at sports and fitness on his YouTube series Workout Wednesdays, and he journeyed across the country with the help of Reddit in his travel program, Riding Shotgun. His videos have over 100 million views over social media platforms. Zach has been a guest star and is now a full-time writer on ABC’s hit family sitcom Speechless. He’s an Ambassador for the Cerebral Palsy Foundation and has worked with UCPLA Wheels for Humanity, which supplies wheelchairs to people in developing countries. 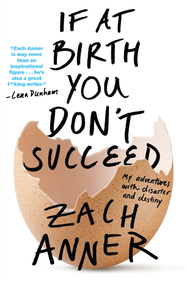 Zach’s memoir, If at Birth You Don’t Succeed: My Adventures with Disaster and Destiny, is a hilariously irreverent and heartfelt memoir about finding your passion and your path even when it’s paved with epic misadventure. Zach Anner splits his time between Buffalo, New York and Austin, Texas and spends most of his time in his underwear, thinking about how he can change the world. You can follow Zach on YouTube, Facebook, and Twitter. When Life Gives You Wheelchair, Make Lemonade Two months early, underweight and under-prepared for life, Zach entered the world with cerebral palsy and an uncertain future. By his thirtieth birthday, he had grown into an adult with a career in entertainment, millions of fans, a loving family, and friends who would literally carry him up mountains. With a mixture of hilarity and heart, hear Zach share his miraculous story. Browse Zach Anner’s Youtube channel for more hilarious clips and tips. Learn more about Zach Anner and his book, and follow him on Twitter. Praise for Zach Anner and If at Birth You Don't Succeed "Zach was absolutely perfect for our audience of parents of children/youth with disabilities and the professionals who work with them. He was inspirational, funny, and just what we wanted. He even tackled some tough topics that our state is going through and managed to give something to both sides of the controversy. I was a little nervous when he started down that path, but he did an excellent job on it." "Zach did an AMAZING JOB. His presentation was very well received by our diverse audience of educators, administrators, parents, community providers, and individuals with autism. Zach’s presentation was inspiration, instructional and full of hope."